Cyclone Idai hit Beira Friday with 170 km/h winds and torrential rains, causing major damage. Even in the central "cement city" buildings were damaged and in the suburbs many houses have had roofs blown off and walls damaged. Aerial photos show the city flooded. There is no electricity or water, and only limited telephone service. All roads out of Beira are now cut off by flooding and washed out bridges and sections of road. The port is totally closed and the airport only partially open. Two photos of Beira are attached. President Filipe Nyusi in a statement this afternoon said the death toll could reach 1000. After smashing Beira, cyclone Idai continued west through Sofala and Manica. It then crossed the border into Manicaland in Zimbabwe, where more than 100 people have died. 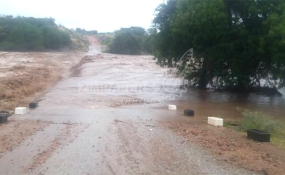 The very heavy rain across the area has caused floods in all rivers, and heavy rainfall is predicted to continue until Thursday, causing rivers to rise further and cutting off roads in even more places. Dondo in Sofala and Chimoio in Manica are now cut off, the President said. The Council of Ministers will meet tomorrow, Tuesday, in Beira.